Last year I entered a competition ‘Norwich Shawls: Past Glory, Present Inspiration’. It was to feature both exhibits of original shawls and new textile work inspired by the shawls. At the time I blogged about the initial re-dyeing and reusing of my silk scraps in preparation for working into a hooked textile wall hanging. My work wasn’t accepted, but it was an interesting experience and gave me the opportunity to find out about the weavers and wearers of Norwich Shawls and consider how to interpret their legacy. Now as I write, with my Art Historian’s hat on, I know that the production of a creative work and the audiences’ reception of a creative piece, is not without context. 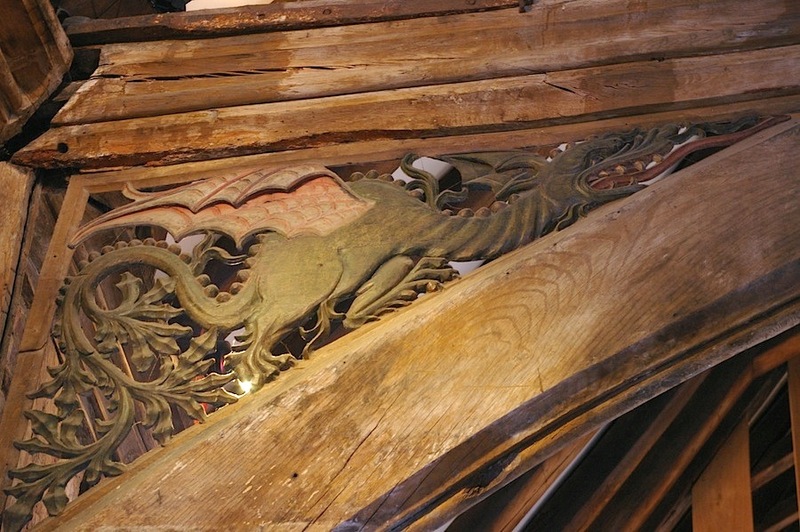 As far as the original, very expensive (then and now) Norwich Shawls are concerned, there is plenty of context. The Norwich Shawl was popular in one form or another across the nineteenth century with at it’s height, a royal wearer. 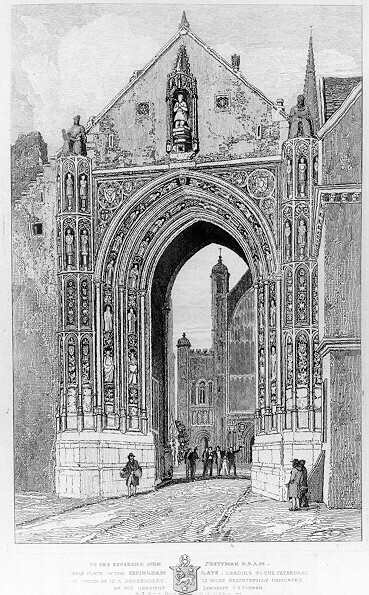 The Great Exhibition of 1851 had provided the weavers of Norwich the chance to exhibit their shawls. When Queen Victoria visited the exhibition she saw some of their work and was duly impressed with the beautiful shawls and later ordered two. 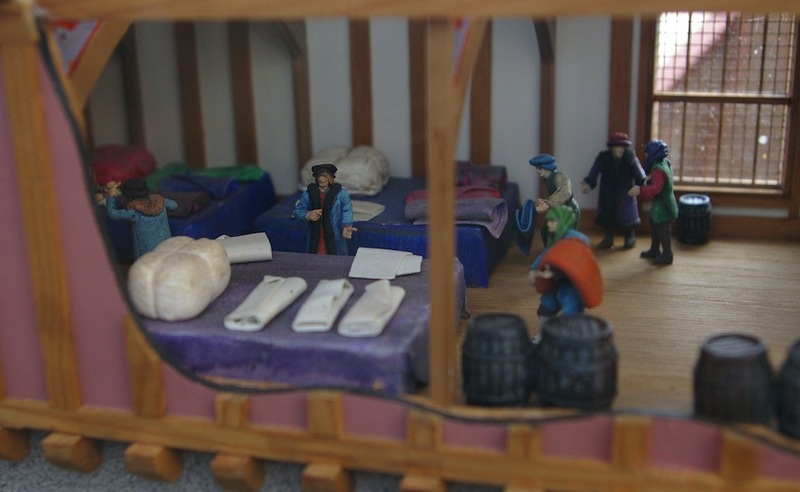 Originally Norwich Shawls were produced by weavers working from home and many of the weavers and their families had a hard and precarious existence as recounted in the following extract. The Jacquard loom at the Museum of Norwich at the Bridewell, Norwich, Norfolk. 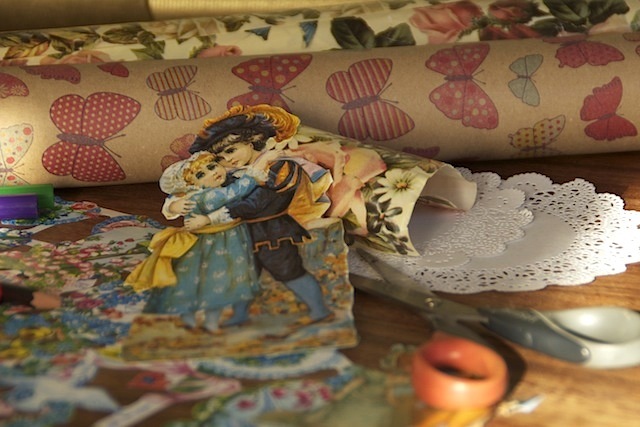 During my research I read about the advancements in weaving technology through the nineteenth century and, in particular, the ability to weave complex patterns with the invention of the Jacquard loom. Specifically in Norwich the industrialisation of weaving was a slow process. The first power-looms introduced by Henry Willett in 1828 were met with a negative response from the city’s hand-loom weavers who smashed the windows of the Willett & Nephew factory premises viewing the new technology as a threat to their livelihoods. Nevertheless, modernity advanced, albeit slowly, and towards the later half of the nineteenth century the larger, more complicated, all-silk Norwich shawls were mostly made on Jacquard looms either in large workrooms or factories. The Jacquard looms were usually too big for domestic houses and so factory life became the norm for most Norwich shawl weavers. This is a short video showing the Jacquard loom (pictured above right) in action. 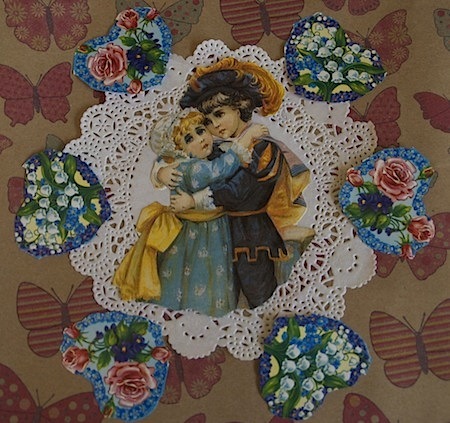 Despite, the industrialisation of the weaving process throughout the 19th century the employment of children in the weaving business was routine both in a domestic and industrial setting. The more I read and learned, the less I felt like ‘celebrating’ the ‘Norwich Shawl’ as simply beautifully woven pieces. The context of their production was as significant as their history of being exemplary textiles prized and owned by a few lucky ladies. What a difference in just 8 weeks! A couple of months ago everything in the garden looked as though the abundance of summer would never arrive and then suddenly here it all is. 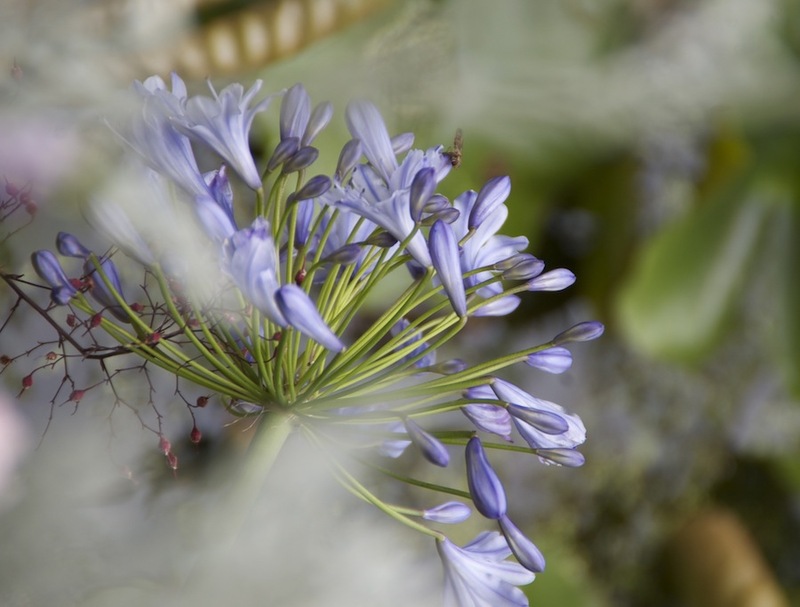 There are plants bursting into flower and flowing all over each other. Here are a couple of examples that have so far withstood the torrential rain we’ve been experiencing, but, sadly, I have to report my old fashioned roses have been hammered. 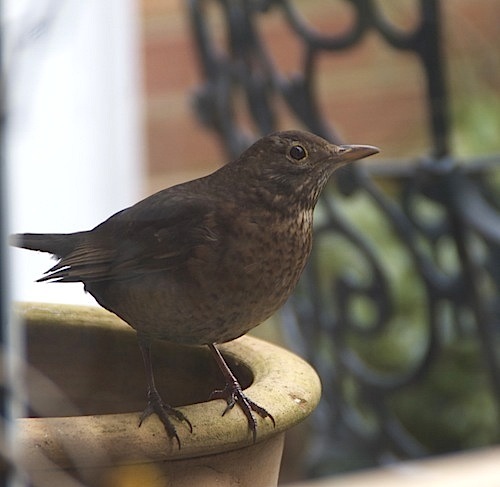 But, after a quick tour round the beds I see there’s plenty of potential waiting in the wings. 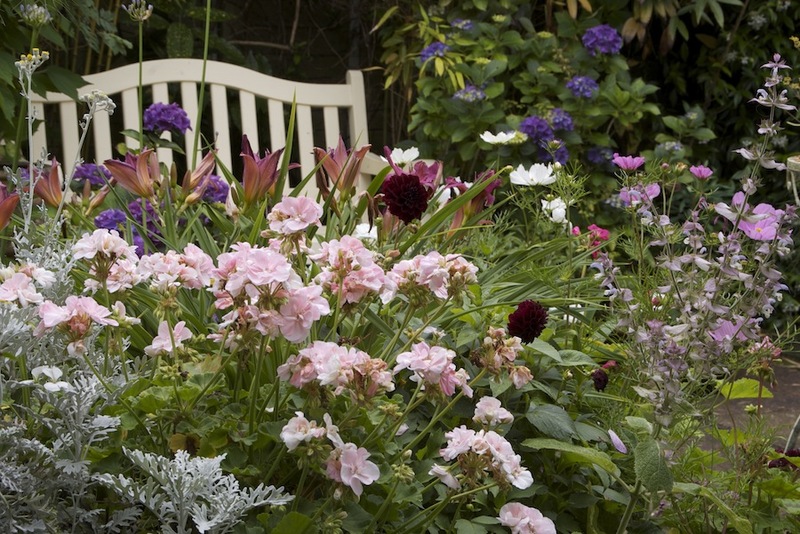 There are lilies, perennial poppies and some knautia all in bud. Of course, the open, cheerful and always reliable oxeye daisies are a favourite with the bees. They also look beautiful and fresh in the early morning sun (when we have some!). Author agnesashePosted on June 16, 2016 Categories Flowers, Gardens, UncategorizedTags azalea, back garden, daisies, East Anglia, Flower, Gardening, knautia macedonica, meadow rue, Norwich, rain, summer, thalictrum aquilegiifolium18 Comments on What a difference in just 8 weeks! Regular readers will know that as I’ve mentioned before I live in the driest region of the UK. Summer in East Anglia is renowned for open, sunny skies above a patchwork of golden fields of wheat and barley blanketing the gently undulating landscape. Not this July, it’s been leaden skies and rain, rain, rain. Last Saturday in the Norwich area more rain fell in a 24 hour period than would normally fall during the whole month of July. Low lying areas are flooding, the fields are sodden and all the delicate flowers in my garden have been bashed to death. I shouldn’t moan too much as earlier in the month there were a couple of bright days ideal for some scarf photography. And, early yesterday morning before the showers swept up the country from the south west, I managed to photograph those resilient summer flowers that can withstand a summer downpour. 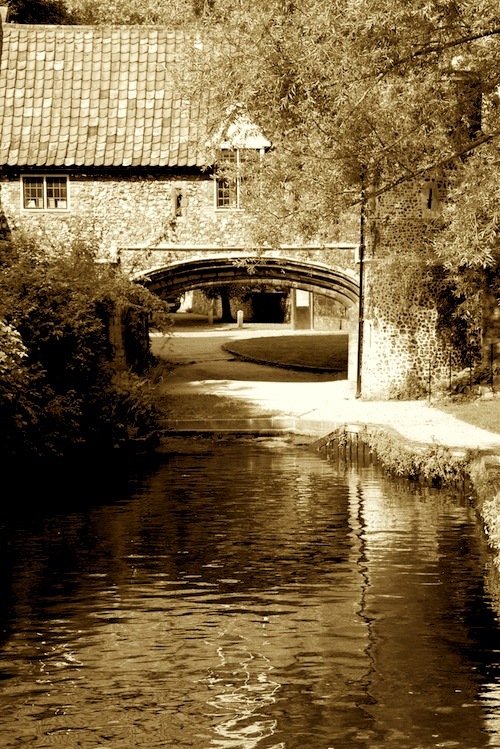 Pulls Ferry, River Wensum, Norwich. Most of us are so wrapped up in our everyday pressures we often fail to stop and appreciate little gems in our familiar surroundings. 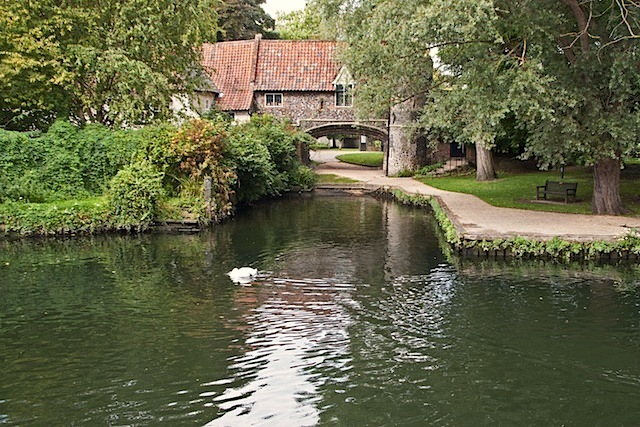 Pulls Ferry marks the site where a channel from the River Wensum was made into a canal during the building of Norwich’s Norman Cathedral. High quality limestone was brought from Caen in France to build the Cathedral. Limestone shipped from France was ferried up the River Wensum and along the canal to the cathedral site. 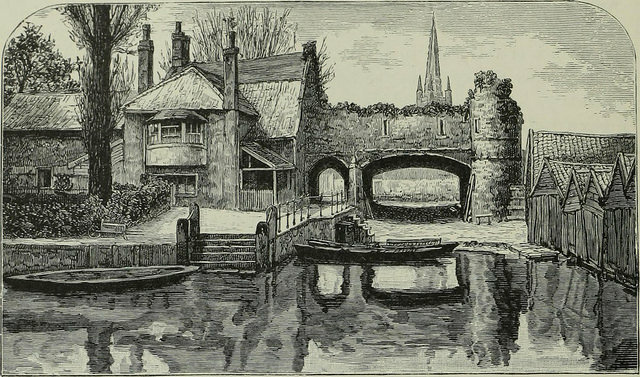 The flint archway and gatehouse tower in the photograph were built over the canal in the 15th century, and the house (obscured by summer foliage but visible in Victorian sketch) in the 16th century. The canal was eventually filled in sometime in the 1770s. 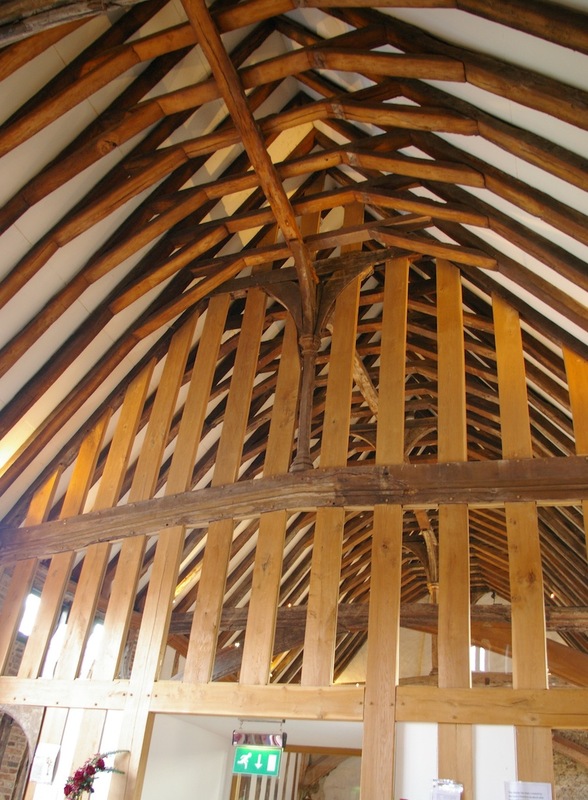 During the 12th century it was important for Norwich as England’s second city to have prestigious buildings. The Cathedral together with Norwich Castle were conceived of as a pair and, significantly, as such a pair, they were both dressed with Caen stone. This is the same Caen limestone that was used for Canterbury Cathedral, Westminster Abbey and the Tower of London. It is possible to view the erection of such buildings, in an almost modern ‘corporate identity’ manner, as the powerful stamping of the Norman mark across the country during the 100 years that followed the taking of England by William the Conqueror and the Normans. 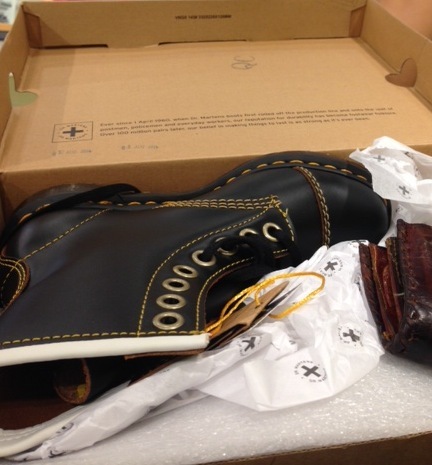 As part of a rather clever marketing campaign the folks at Dr Martens had a special few minutes this morning when they opened their stores and sold their classic Monkey boot at its original 1960s price – that was £3 – nowadays £110. Obviously there was a limited stock at this low, low price and obviously there was a long, long queue snaking up to their doors. 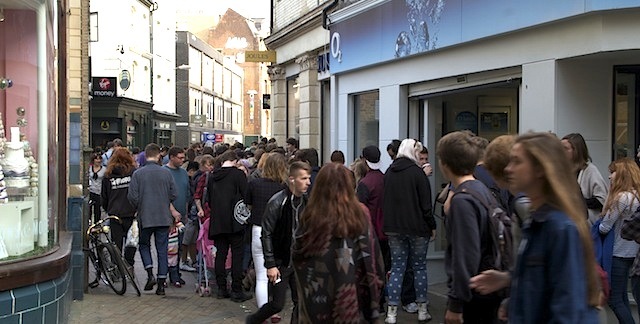 Queuing outside the Dr Martens shop in Norwich – quite early! Queuing outside the Dr Martens shop in London – very early! My daughter and I launched a two-pronged attack, she went to Schuh at Marble Arch in London and I trekked into to join the queue outside the Dr Martens in Norwich. When I arrived it was already over 100 people long with some determined people queuing since 3.00am, but I thought I’d wait anyway. Even in England where we Brits are famous for queuing you still get the odd queue-jumpers. This pair of lads shuffled up to join their friends and then stood their sheepishly as a wave of muttering rolled over them. As it was no-one this far down the queue got anywhere near the £3 boots, but we were all given 25% off vouchers by a helpful shop assistant at 8.50am. You might well look at your feet – queue jumper! Mmm – 25% – they don’t look too impressed. Despite my failure, all was not lost because my daughter (a true early bird) in London got the boots she wanted at the 1960s price. 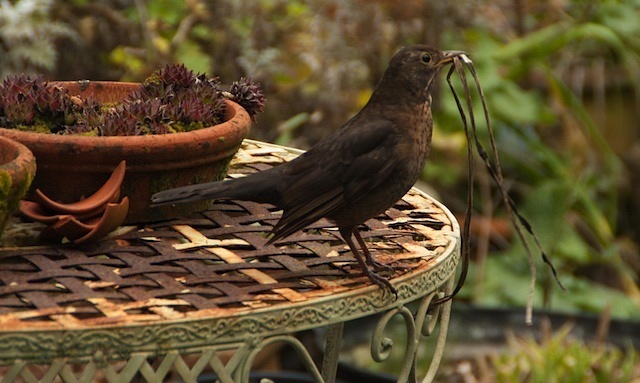 At least one early bird caught the worm. Sir Thomas Erpingham was a fifteenth-century English nobleman who distinguished himself when in charge of the King’s bowmen at the Battle of Agincourt in 1415. 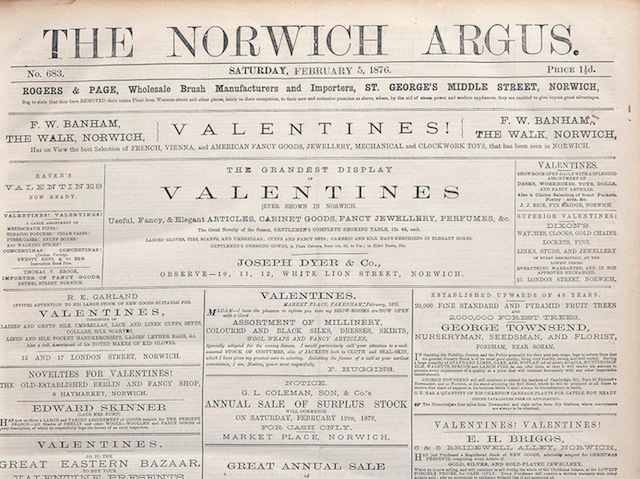 As an important and significant Norwich figure he made substantial donations to the city’s religious institutions. 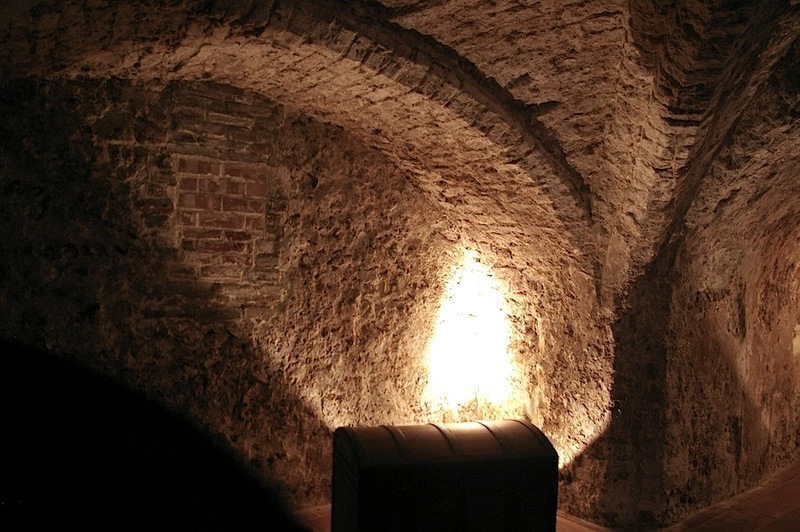 Charitable donations during the medieval period were more than just duty, they allowed an individual to display their status, but, more importantly, financially supporting the church purchased a speedy journey through purgatory and up to heaven. 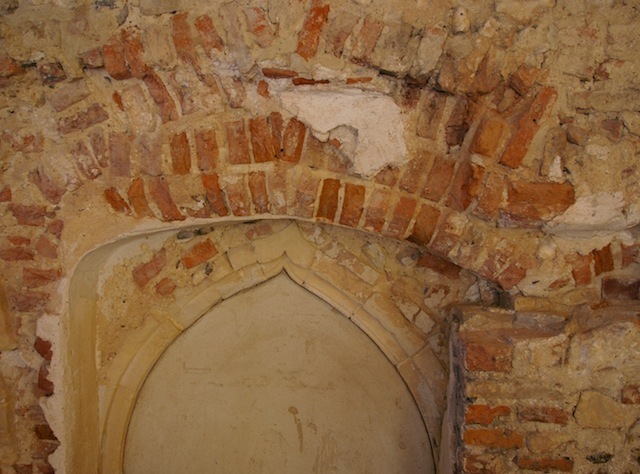 A wealthy knight like Thomas Erpingham made a very significant earthly and heavenly mark when he provided the funds for the building of a new gatehouse at the entrance to Norwich Cathedral. The gatehouse was built between 1420 and 1435 and has a single arch supported on each side by semi-hexagonal buttresses. The arch is divided into two decorative schemes, the inner order is the twelve apostles (probably) set in a series of niches, and the outer is a series of twelve female saints. The carved foliage, used as a visual linking device running up the arch, has been weathered over the centuries, but you can still see that it is oak leaves and acorns. The buttresses are covered with shields and devices of the families of Erpingham, Clopton, and Walton (those of Sir Thomas Erpingham’s wives), but I couldn’t pick out the forget-me-not design which apparently also makes up part of the Erpingham heraldic achievement. 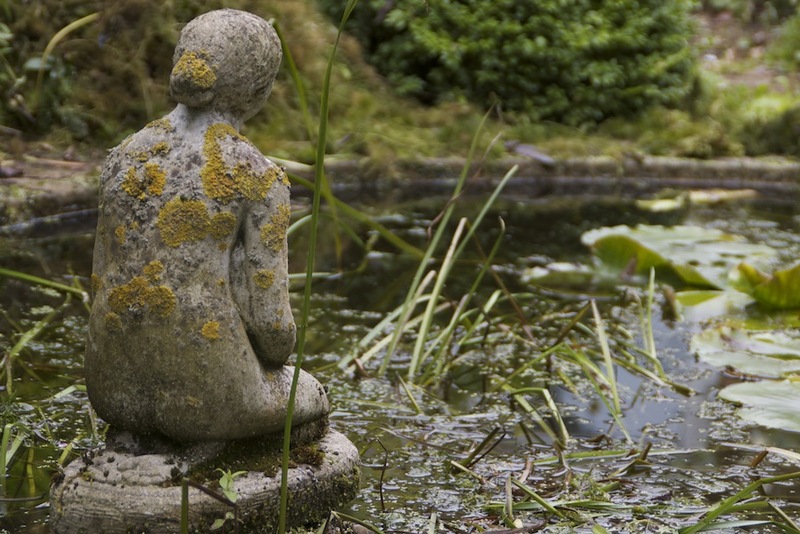 I was disappointed that I couldn’t see the forget-me-not sculptural detail so I’ve had a good hunt round the Internet. One of my past Art History lecturers, now retired, has spent six years accompanied by his photographer wife, surveying the public sculpture of Norfolk and I’ve studied her excellent, up-close and detailed photographs and I’ve found the forget-me-nots. It is a single flower motif carved above a shield, above a falcon rising on the outer front columns of the buttresses – second panels up in this early nineteenth-century etching by Cotman – still a bit difficult to see though not as eroded as now. Below is a ring from MagpieHouse showing a contemporary version of the single, more architectural form, of the forget-me-not motif. When you are looking at weathered architecture it certainly helps to know the basic design shapes you are looking for, but it is only when the scaffolding goes up for repairs that accurate recording and high quality photographs can be achieved. The fifteenth-century forget-me-not sculpted motif is in the middle of the upper niche in this photograph on the right. 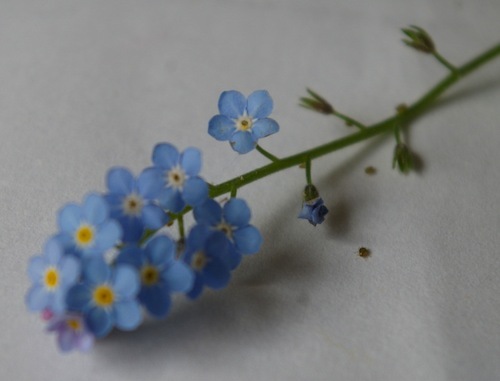 The simple five petalled flower of the forget-me-not. The pleasure and the pain – Internet shopping versus the mall. 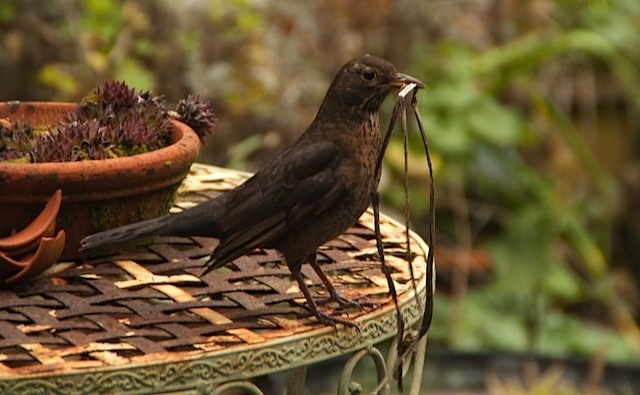 I spent last Sunday in the garden, came in wind blown and muddy, balancing on one leg to get my boot off lurched towards the door and ripped the curtain down. How clumsy? After sorting myself out I examined the curtain damage and realised it was beyond repair. Now, I never really liked the curtains, but I chose the fabric as the least objectionable of a poor selection in a big department store about a decade ago. At the time I had been to four different specialist shops (two have since folded) before ending up in the John Lewis soft furnishings department. I ordered from their swatch samples and had to wait a couple of weeks for delivery. It wasn’t really a painful experience just irritating and certainly not pleasurable. This time I’ve spent a couple of evenings on the computer searching through an almost overwhelming choice, have had swatches arrive speedily and have received my chosen curtain fabric this afternoon. Less than a week and with so much choice – Internet shopping – a great improvement, but I had missed something. The Internet purchasing was efficient and the choice amazing. Even some of the eShops were beautiful too, Fabrics and Papers, for example, but I was still stuck at home on my computer. I suppose in an ideal world we’d have the choice that’s available online, but sourced locally and found round the corner in a delightful emporium staffed with smiling, helpful assistants. 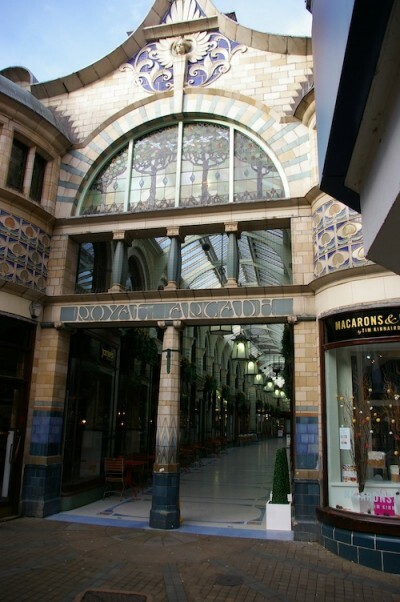 Here, in Norwich, we are lucky enough to have the Victorian’s version of a mall, the Royal Arcade. 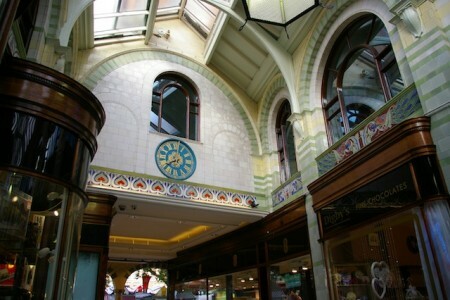 A charming Arts and Crafts shopping arcade designed by local architect, George Skipper, and built in 1899. The souvenir guidebook published at its opening tells us about the agreeable activity of shopping in the Royal Arcade. Nowadays, the Royal Arcade is home to a variety of shops including longtime residents, The Colman’s Mustard Shop and Langley’s Toy Shop, and a recent newcomer Macarons & More selling delicious cakes. In the 21st century we all wish we had the time to dally over the delights of shopping and perhaps purchase a box of macarons. 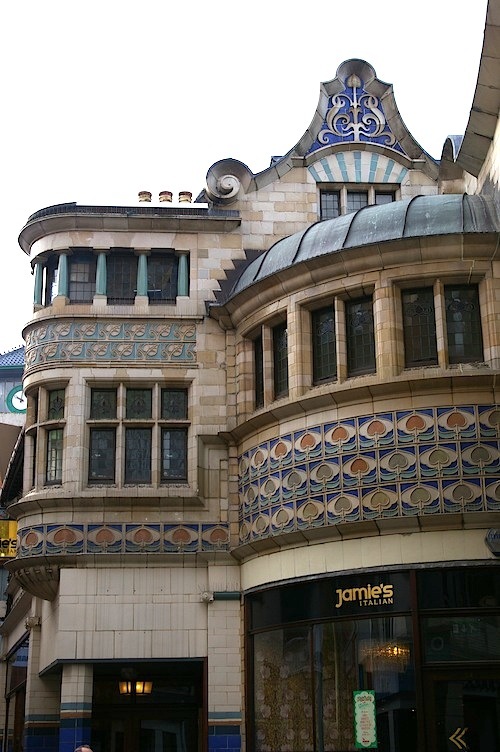 Look up and see the polychrome brickwork and colourful tiled details of this fine Arts and Crafts architecture. 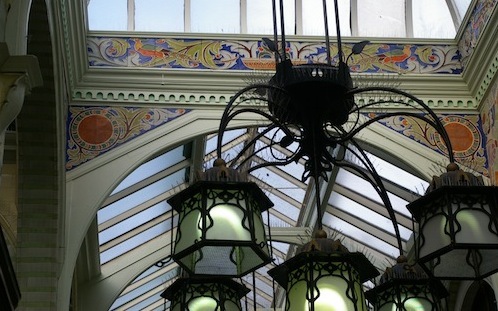 Author agnesashePosted on March 21, 2014 Categories Architectural Ornamentation, East AngliaTags architectural detail, Arts and Crafts, Floral motif, George Skipper, Internet shopping, Norwich, polychrome brickwork, polychromy, Royal Arcade3 Comments on The pleasure and the pain – Internet shopping versus the mall.